This post contains affiliate links. For more information, please click here. I'm pretty happy with these Teacher Appreciation cards I made using Lil' Inker Designs Apple Shaker Die and Apple of My Eye Stamp Set. 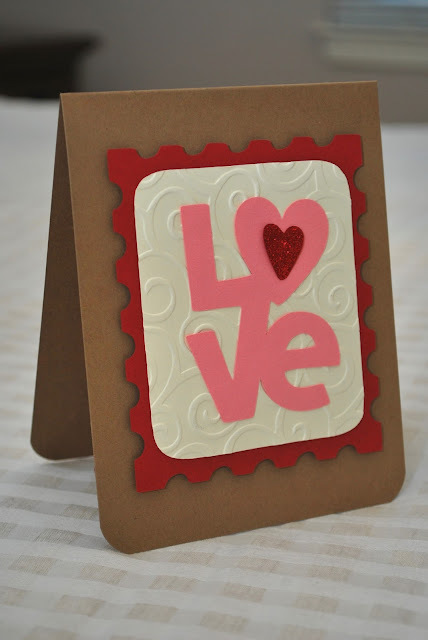 I also used my CottageCutz stitched rounded rectangle dies (love those!! ), and some cute alphabet patterned paper by Recollections. 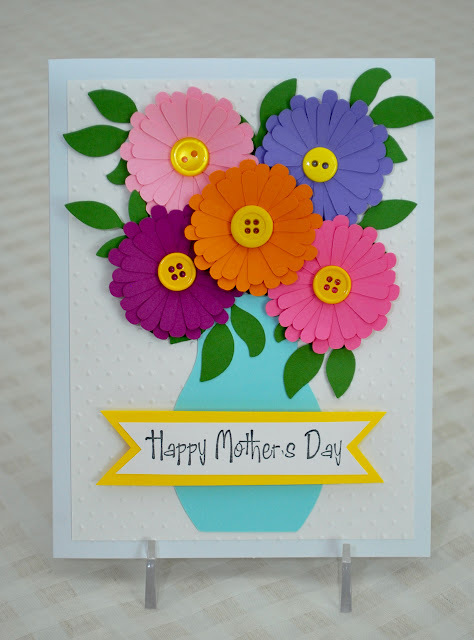 With spring in full bloom here in Maryland, and Mother's Day just around the corner, I decided to make a pretty floral Mother's Day card today. I'm pleased with how it turned out! I've been loving the flower shape on my Cricut Creative Cards cartridge. It cuts three copies of the same shape at slight different sizes, which makes it easy to layer. I love the added dimension it gives the finished product. 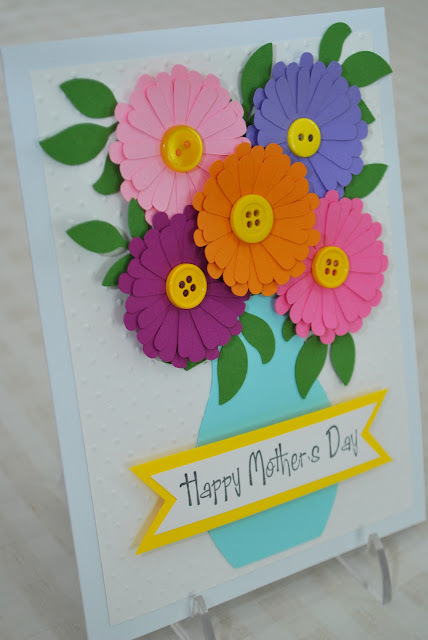 For additional dimension, I embossed the background with my Swiss Dots embossing folder, glued various yellow buttons in the center of each flower, and popped the stamped sentiment with adhesive foam squares. Click here to see this item in my Etsy shop. Thanks so much for stopping by! 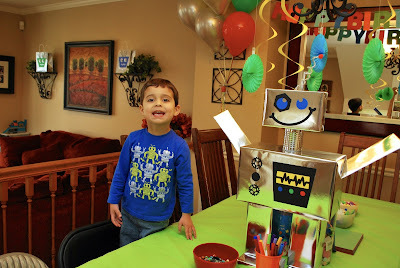 When my middle son turned four, he declared that he wanted a robot party. It turned out to be such a fun, cute theme! I used lots of silver, red, blue, and green when making the decorations. 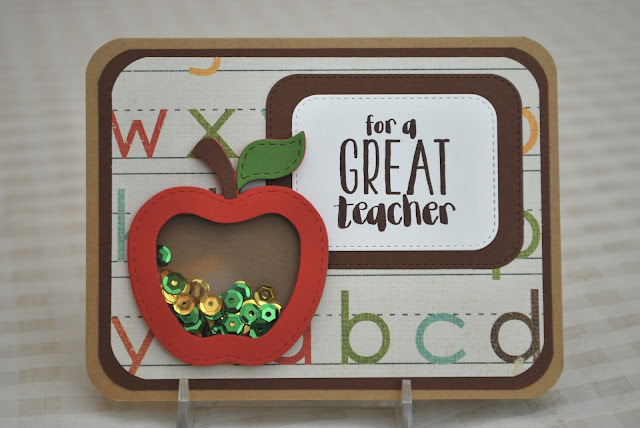 I relied heavily on my Cricut Robot Party cartridge and Robotz cartridge to make everything. My favorite decoration was this cute robot centerpiece. I started with cardboard boxes in various sizes and covered them in metallic silver wrapping paper. I used an empty can with the label removed for the neck, and hot glued all the pieces together. 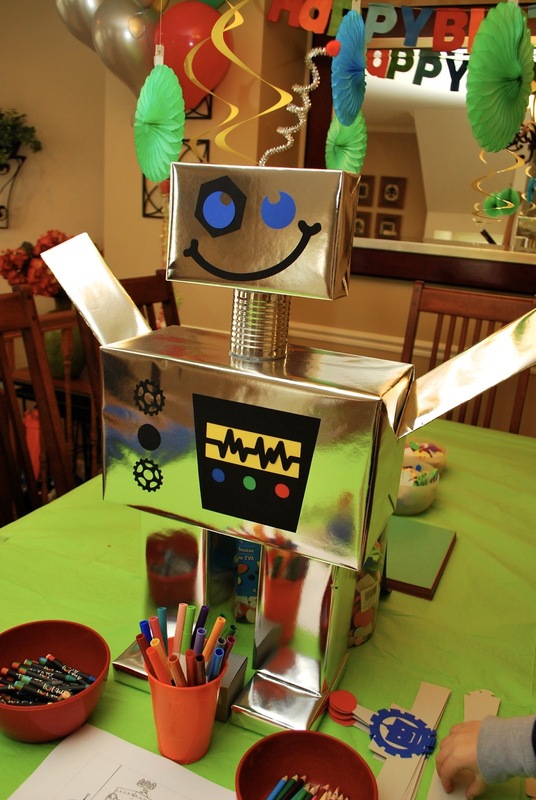 Then I added embellishments from the Robotz and Robot Party Cricut cartridges, and added a silver pipe cleaner with a red pom pom to its head. Instead of traditional party hats, I made several of these cute robot headbands from the Robot Party cartridge. I used a black marker to draw robot faces on some of the silver balloons we had hung up. I once again used the Robot Party cartridge to create the goody bags. I cut the robot faces out of red, green, and blue cardstock, twisted some silver pipe cleaners for antennae, and adhered them (along with googly eyes!) to metallic silver bags. As the guests arrived, they were invited to color in some robot coloring pages I had printed out. They could also design their own robot, using geometric foam sticker shapes and construction paper. 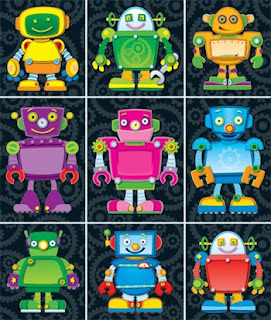 The kids came up with some cute and colorful robot pictures! Once everyone had arrived and had a chance to complete their art projects, we went down into the basement for some games. 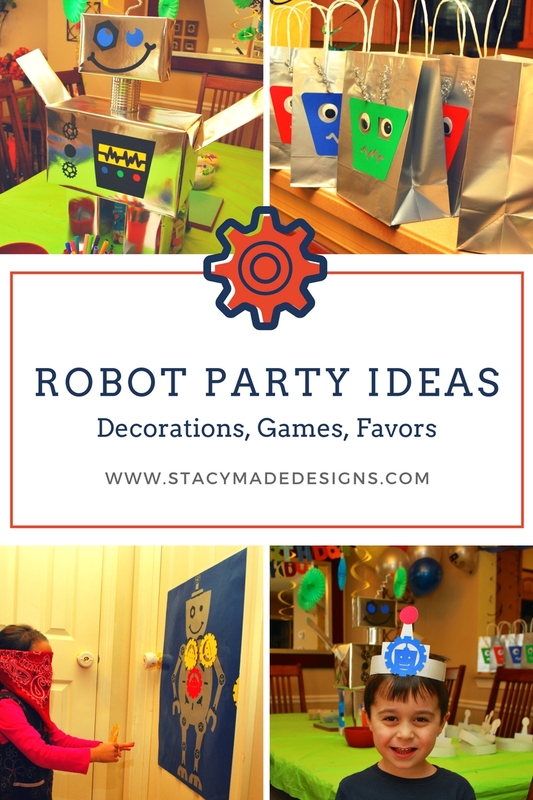 Before the party, I had hidden robot shapes around the room. 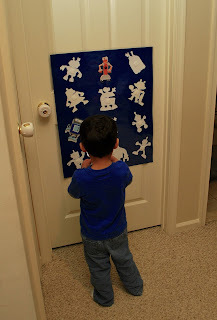 I hung a poster up that had the silhouettes of all the robots the kids needed to find. Each robot piece was laminated and had a Velcro dot on the back, so once it was found the kids could match it to the correct shape on the poster. It was sort of like a hide-and-seek robot puzzle! 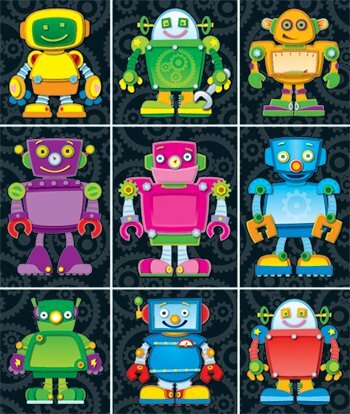 I used the Robotz Cricut cartridge to cut out the robots. The next game was "Pin the Gear on the Robot." I had created a large robot shape on posterboard, and used the Cricut to cut out gear shapes for the kids to try to put in the right spot. After the games it was time for cupcakes. I made both chocolate and vanilla cupcakes, and topped them with silver sprinkles and plastic robot rings. The kids were sent home with their artwork, headbands, and goody bags, which included some fun robot prizes like these adorable stickers. Like many boys his age, my middle son is obsessed with Minecraft. 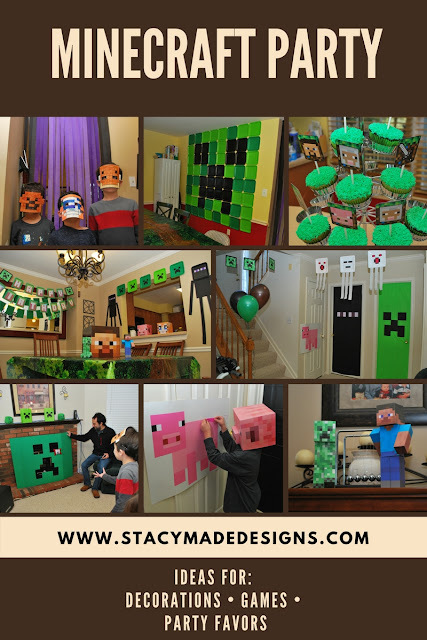 He had decided on a Minecraft party theme months in advance of his seventh birthday, which gave me time to learn enough about endermen, ghasts, and creepers to pull off a respectably authentic party! 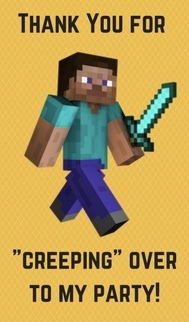 One of the main characteristics of Minecraft is that everything is made of squares. I ended up using a TON of square paper plates to decorate, as well as to serve food. I used 9-inch plates in lime, dark green, and black to make a huge creeper face on the kitchen wall. I used my Cricut to cut some creeper faces to attach to green plates - I simply used Cricut Craft Room to weld squares and rectangles together until I was pleased with the design, then cut it out of black cardstock. The black endermen were made with strips of gray and purple cardstock for the eyes, black cardstock for the body, and black streamers for the arms and legs. In the basement, where we played most of the games, I used white paper plates, white streamers, and black and red cardstock to create ghasts, then hung them from the ceiling with fishing line. 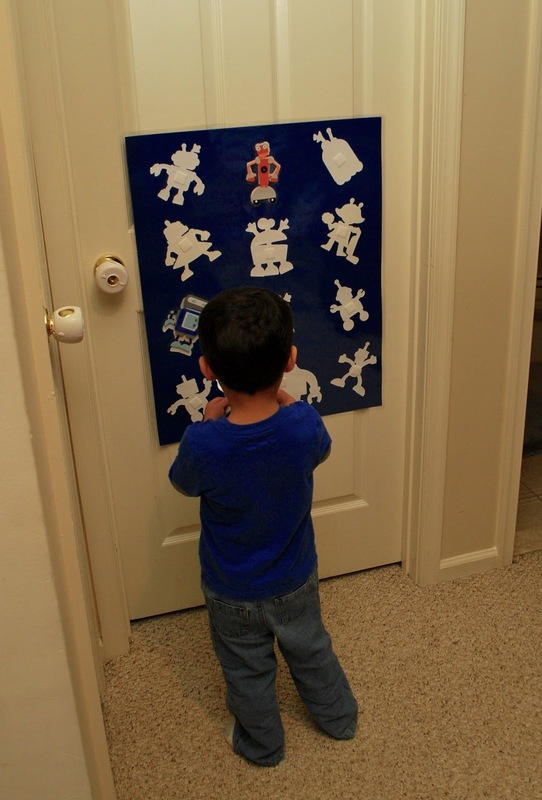 I used solid green and black plastic tablecloths and cardstock to create the enderman and creeper faces on the doors. I also printed out some creeper faces I found online and hung them with fishing line. I found these perfect forest path tablecloths to decorate both the dining table and kitchen table, as well as a giant cardboard Steve head for the centerpiece. For many of the paper decorations I made, I used this wonderful website: FPS-X-Games. Be warned - the printables used a fair amount of printer toner, but the kids loved seeing their favorite Minecraft characters throughout the party! One of my son's requests was that I create a Nether Portal in between the dining room and kitchen. 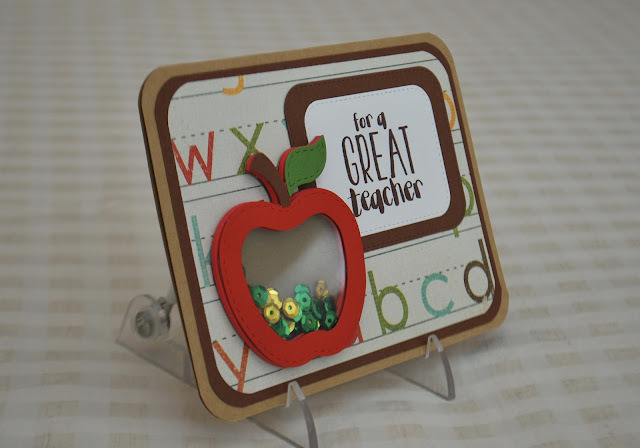 I used black posterboard for the top, and cut letters out of white cardstock using my Cricut. Then I taped long strips of purple and black streamers to the black top. 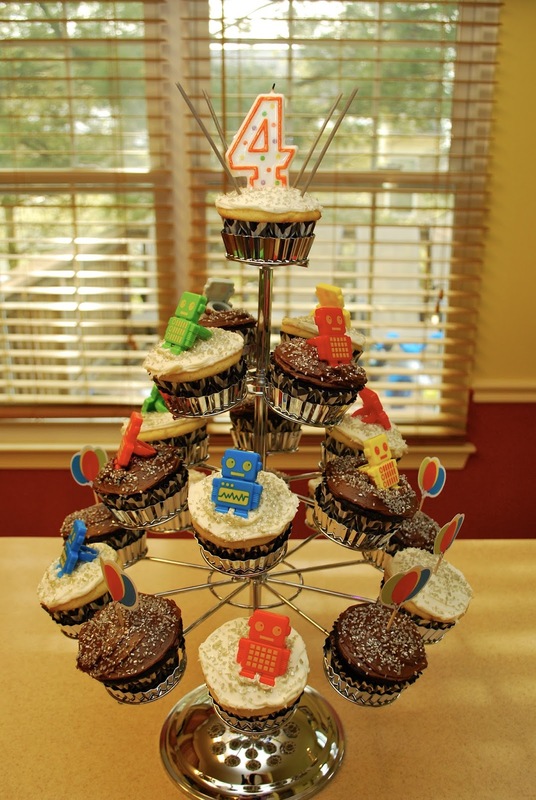 Amazingly, it held up through the whole party (and the next day! ), even with all the kids running through it over and over again! 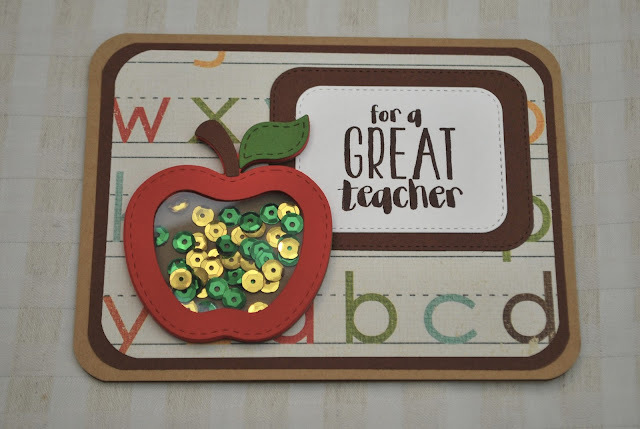 I downloaded this cute (and free, with newsletter subscription) birthday banner from this blog: Jennifer Maker. I mounted the letters on cardstock for stability, then punched holes for the string. As the guests arrived, they were invited to color a pixel mask to look like their favorite Minecraft character. The kids LOVED this and spent way more time on it than I thought they would! Some dedicated artists even returned to the art table to perfect their masks throughout the party. 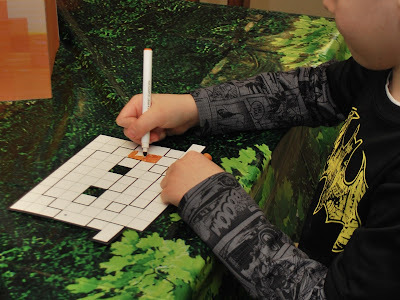 Next we played a Minecraft Bingo game, which I downloaded from this website: Life With Squeaker. Luckily most of the guests were first graders who could read - some items had very similar images, so it was helpful that they could read the names. 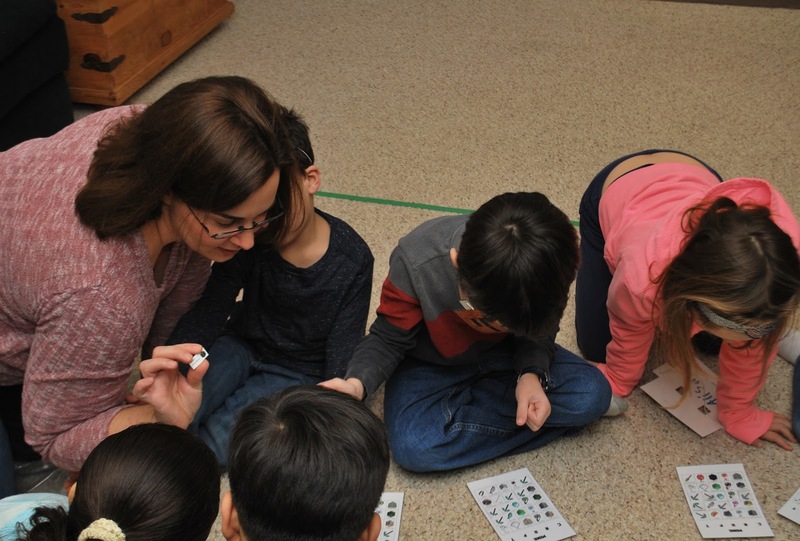 If your guests are younger or non-readers, you may want to find a simpler Bingo game! After Bingo we played Pass the TNT, which was basically Hot Potato with felt beanbags I had made to look like Minecraft TNT. Then we used those same beanbags for a Creeper Toss game, trying to throw them through holes I had cut in a green trifold cardboad display board. Next up was Pin the Tail on the Minecraft Pig. I had used various shades of pink cardstock to create a Minecraft pig on white posterboard, and cut out tails for each guest. I used a printable pig mask instead of a blindfold, which was pretty funny to see! After the games in the basement we had lunch and opened presents, and then went into the living room to play another Minecraft game. I had hidden plastic eggs around the room, and inside each egg was an ingredient needed to make a cake in Minecraft. I attached Velcro dots to each piece, and taped a master chart on the wall. As the kids found the eggs, they attached their ingredients to the master chart. Once it was filled, it was time for cupcakes! I made chocolate cupcakes and used Wilton's grass frosting tip. I used these printable cupcake toppers attached to lollipop sticks. After cupcakes we had time for one last game, and it turned out to be one of the kids' favorites! I divided the basement in half using green painter's tape, and I had blown up about a dozen lime green balloons to look like Minecraft slime balls. I split the kids into two teams, and the goal was to get as many slime balls on the other team's side before I yelled "stop." 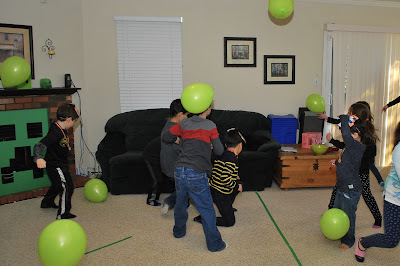 We played several boisterous rounds of this game - it was a great way to burn off some of the sugar from the cupcakes! 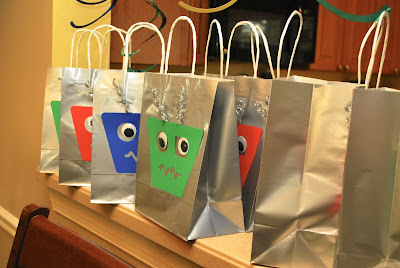 I used creeper faces cut with my Cricut attached to green bags for the goody bags. I also designed a favor tag with an image of Steve and the phrase "Thanks for creeping over to my party." 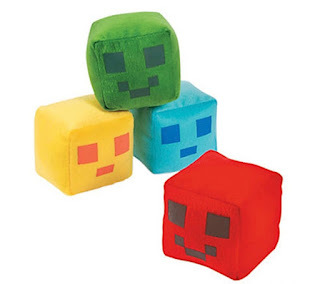 I filled the goody bags with some Minecraft-themed goodies, including these adorable pixel plush toys - they were a big hit! 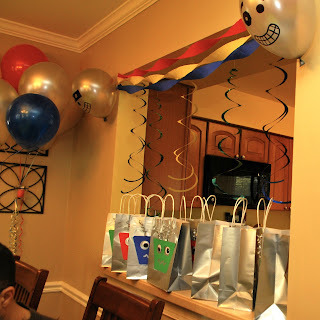 Overall it was a great party and I think the kids had a lot of fun. I'd love to hear about your Minecraft parties in the comments! Thanks for stopping by! Today was my first try at a shaker card! I've seen them around for years, but just never tackled one until today. I'm not sure what took me so long, because it really wasn't too hard! Now I'll have to remember going forward to save plastic from my packages so I can make some more soon - I may be hooked! This also marks my first time participating in a Challenge Blog. Shopping Our Stash's weekly challenge theme is "All That Glitters is Gold," and I thought this card fit the bill nicely! 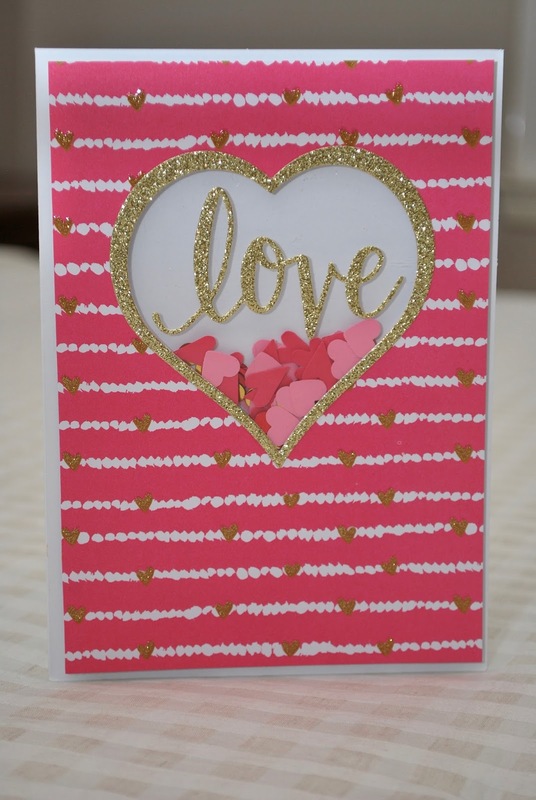 To start, I used my Nellie's Multi Frames heart dies to cut a heart shape in some patterned cardstock from Michael's. I then cut a gold glitter cardstock frame to go around the opening with my heart dies, as well as the "love" sentiment using my Hero Arts Cut & Stamp set. I flipped the paper over and adhered a square piece of thin plastic to cover the opening, and lined the edges of it with foam squares. 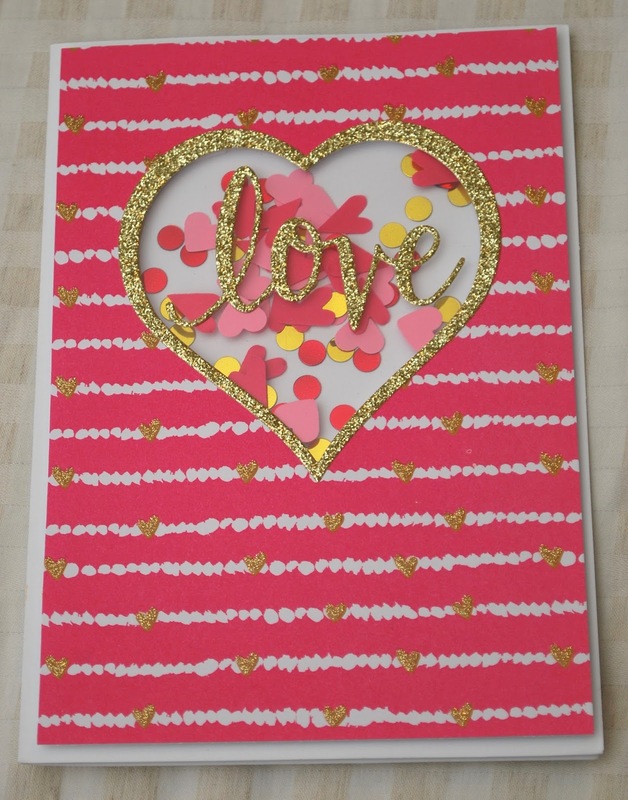 I filled the center with sequins and punched hearts, then stuck it on the white card base. This picture shows the variety of hearts and sequins inside the shaker. To see this item in my Etsy store, please click here. Thanks so much for stopping by! I recently saw the Hero Arts Stamp & Cut packs for the first time, and I was so excited to try them out! This card came together quickly, and I love the simple elegance of it. 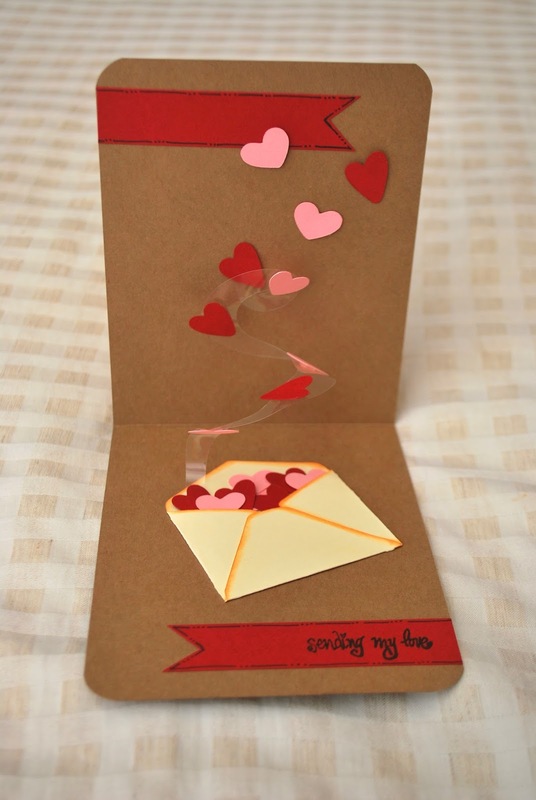 I started with a sheet of kraft cardstock, cut vertically down the center and folded in half. 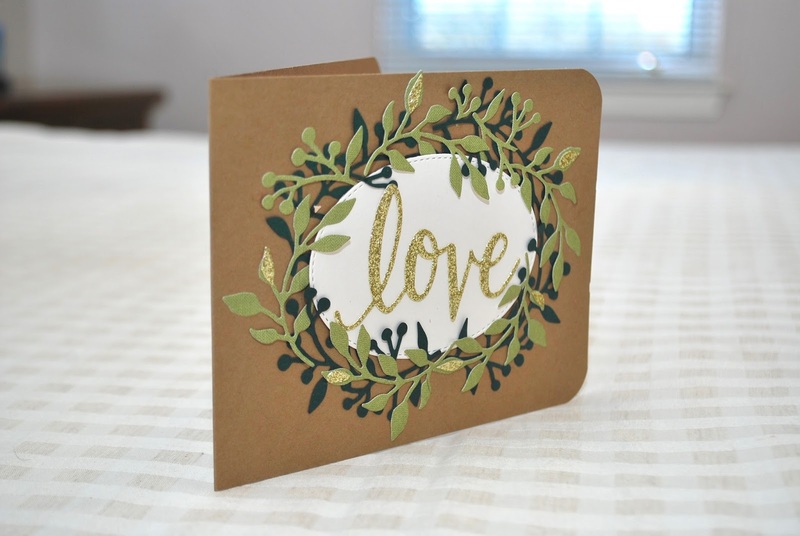 I then used various dies to make the stitched oval and foliage. 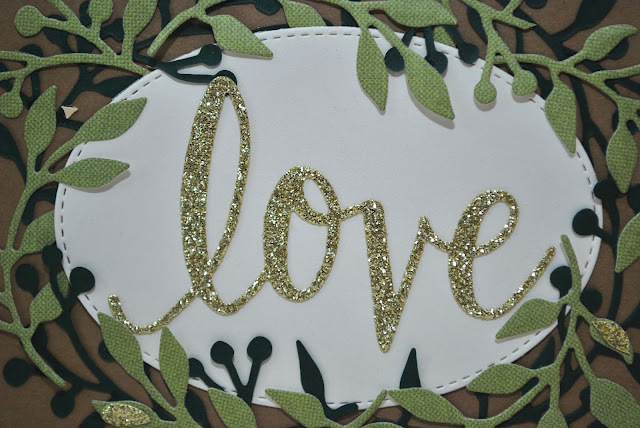 I used the "love" die on gold glitter cardstock for the sentiment. It cut beautifully through the thick cardstock! 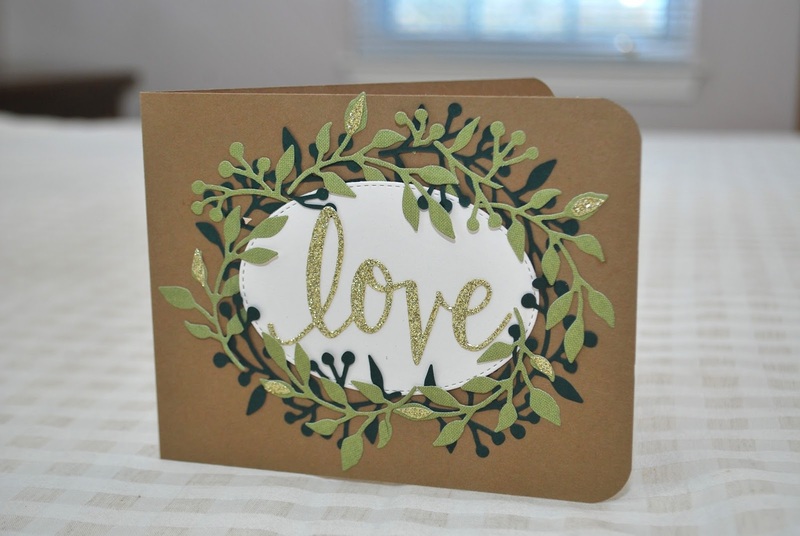 I hate to waste any paper, especially premium paper like the glitter cardstock, so I cut my scraps into small leaf shapes to layer on the green foliage. I love how it gave it a little extra pop. Click here to see this item at my Etsy shop. Thanks so much for looking! I have a lot of old Scrapbooks Etc. magazines from back when I had a subscription to it, but they were taking up too much valuable real estate in my crafting area. I decided to go through them and pull out any ideas I wanted to keep and organize them into a binder. 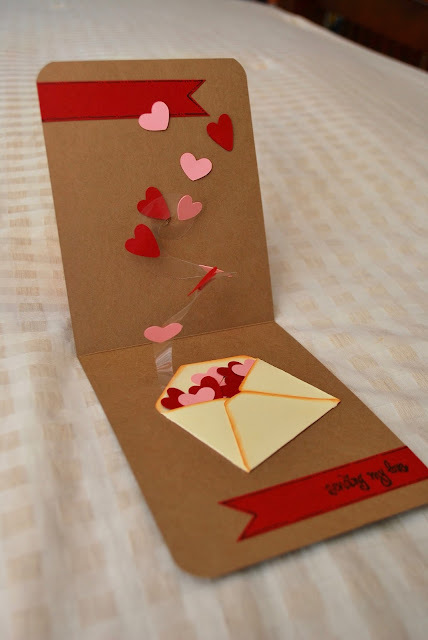 One idea that caught my eye was to use a spiral of paper to make a pop-up card. Taking that one step further, I thought it would be neat to make a spiral out of transparency to make sort of an invisible pop-up card. This cute Valentine card is the result! I used my Cricut and Cuttlebug to cut and emboss a simple embellishment for the front of the card. 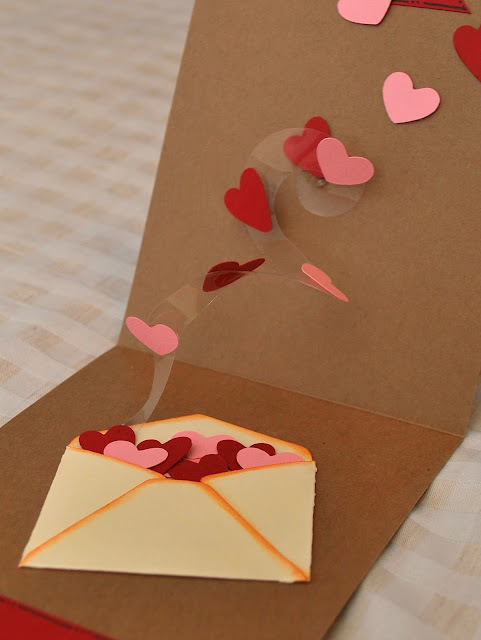 The envelope, hearts, and transparency spiral were cut using the Cricut, while the banners were hand cut. I added a little bit of doodling along the edges of the banners, and stamped a sentiment with a Studio G clear stamp. I used my hot glue gun to attach the hearts to the transparency, both because it dries clear and because it made the hearts a little more dimensional. I used my Cat's Eye ink pad to ink the edges of the envelope before assembling it. The transparency I used was just a regular old page protector that I cut into a single layer before feeding it into the Cricut.